HEPA Filtration Designed for Homes. 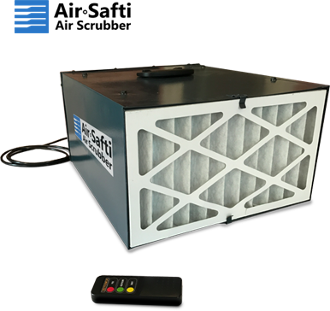 The AirSafti Professional Air Scrubber is a three (3) speed, remote controlled, quiet, well-built steel unit that forces up to four hundred (400) Cubic Feet per Minute (CFM) through its powerful HEPA rated 2 stage filter system, filtering down to.5 microns. Filtering out Mold Spores, Fine and Ultra-Fine Particulate, some Disease-Causing Bacteria, Pollen, Dust, Insulation Fragments and more.